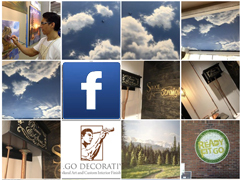 G.Go Decorative is a professional Mural Painting and Faux Finishing company serving Denver and surrounding areas. Decorative painting includes murals, faux finishing and artistic painting techniques that bring the surfaces of your room together into a cohesive design. We use color, texture and imagery to blend your existing space with the atmosphere you desire. Our goal is to create the feel of a theme in your living environment. Gary Gomez founded Denver based G.Go Decorative in 2004, and combined his skills in fine art, mural painting, and graphic design to create a unique interior decorating service for homes and businesses. Graphic design principles have played a vital part in his composition and color selection today, and this is definitely a bonus for clients. We offer a unique preview of your finished room in a digital photo – before the work begins! As a talented and trained artist, Gary delivers an impression-realist mural art style, but he can replicate any mural art style desired; from Disney to DaVinci. His artistry is also noticed in the works of his decorative painting and plasters – displaying consistency, smooth blends and subtle rhythm. These are vital to a natural looking and properly balanced finish. Replicating natural materials, known as Faux Finishing, also takes a trained and talented hand. These finishes demand knowledge of transparency, layers, and specific application of an organic and precise fractal technique in order to appear convincing. Gary is constantly honing his of craft with continuing education in all areas of decorative arts, and has completed multiple courses from “The School of Applied Arts”, “If Walls Could Talk School of Decorative Arts”, and “Bella Vernici Decorative Concrete”. Gary is a member of the Professional Decorative Painters Association, The Rocky Mountain Design Collective, and the International Decorative Artisans League. “The heart of an artist, the quality of a craftsman.” This is what you can expect from G.Go Decorative. Pricing is based on size, detail, and technique for every project. Call for a price range estimate. Some projects can be done in one day! Larger projects average 5-10 days to complete once production begins. Allow 3 business days for written proposals, 5 business days for sample board, projects can be scheduled as soon as the bid is approved. I respect your home, privacy and time. I can arrive as early as you like, and I will leave around 5:30 each day to give you your house back. I pick up after myself and I’m a stickler for cleanliness. I’m extremely careful and insured for the safety and protection of your home. When necessary, I only hire experienced and trained decorative artisans to assist me with making your project beautiful.